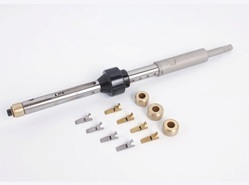 - This "One Revolution" Internal Tube Cutter is designed for hand operation using a ratchet handle. Our organization deals in a comprehensive range of Internal Tube Cutter. - This PR series is for thick walled boiler tube upto 4" O.D. - Model 106 features a tool steel and aluminum body while 108 and 109P have cast iron bodies. - Each model features hardened steel rollers and cutter wheels. - Model 109P is equipped to cut PVC or ABS plastic. Push Type Internal Tube Cutter used for cutting inner diamension of tube. We provide Tube Cutter that is used to internally cut the tube and lessen the force, required to pull a tube. Our tube cutter finds application in pipe fitting and plumbing works. With the specialty of skilled professionals, we are affianced in presenting a matchless collection of Internal Tube Cutter. 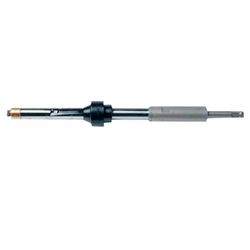 - POWERMASTER “One Revolution Internal Tube Cutter pierces and cuts off non-ferrous and thin walled ferrous tubes in one revolution. - This “One Revolution Internal Tube Cutter is designed for hand operation using a ratchet handle. Designed for cutting of steel, Brass And Copper Tubes In Heat Exchanger, Condenser, Air Cooler, Boiler etc. We provide Tube Cutter that is used to internally cut the tube and lessen the force, required to pull a tube. Manufactured using quality raw materials, this tool is available in various specified forms as demanded by the customers. Our tube cutter finds application in pipe fitting and plumbing works.